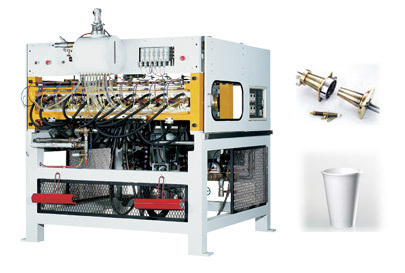 Sunwell Global is able to offer turnkey solutions for the production of EPS cups. The process starts by expanding the gas filled beads through a continuous pre-expander with maximum throughput of 250 kg/hr using beads for multiple molding machines. The beads are air dried across a fluid bed and sieved to ensure size consistency. The dry expanded beads are transported by blower to storage / aging bags before being conveyed to the molding machines. Sunwell 10 cavity molding machines move horizontally driven by a pneumatic-mechanical toggle system to give powerful clamping forces and high productivity. Design improvements to machine and tooling have led to faster heating and cooling times, reducing steam and energy consumption. The molding machine is controlled by PLC with a touch screen interface and faster cycle times have improved productivity and reduced floor space requirements. Sunwell provides cup unscrambling and collecting systems with the option of an automatic and continuous leak detection system. Automatic counting and bagging equipment can also be provided capable of accepting stacks from 4 machines and packing 1 to 3 stacks per bag at a rate of 25 stacks per minute.